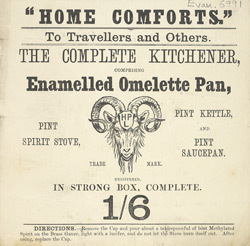 This is an advertisement for a set of cooking pans including an enamelled omelette pan. Saucepans and cooking pots were by the mid 19th century usually made from cast iron, these although still very heavy were more practical than the brass and copper pans used in the 18th century because they did not require so much cleaning and polishing. In larger kitchens there would have been special pans for every dish from baking fish and making sauces to steaming vegetables and making omelettes.